There are 5 comments for this item. The original Bozo was Vance "Pinto" Colvig, who was also the original Goofy. Bozo was originally heard in the late 1940s on a series of 78 RPM records produced by Capitol Records. 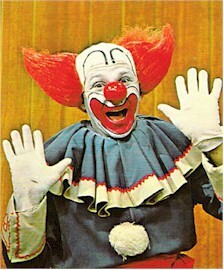 Pinto Colvig was also seen as the first TV Bozo soon after commercial TV started in Los Angeles (1948). A few years after that Larry Harmon got the rights for Bozo to create a cartoon series (Harmon was the voice of Bozo). Pinto's son, Vance Colvig, (Jr.,) was then the Los Angeles TV Bozo, first on KTLA in the late 1950s. NYC during the late 1950's and into the mid 1960's. Clown TV Show" on any local market in this country? I do know that "Mr.Green Jeans" was on "Captain Kangaroo"
Wait... Wasn't Mr. Green Jeans on Captain Kangaroo? I remember I just loved Mr. GreenJeans on Bozo the clown show!